Zimbabwe's government announced that the owners of the local dollar, which has been suspended by the years since, they can convert their assets into US dollars, so that the latter is equal to 35 million dollars (quadrillion) Zimbabwe Dollar. Zimbabwean government is seeking to fight inflation is unprecedented that hit the country a few years ago, and in 2009 decided to suspend the deal local dollar, and replace it with the USdollar or the South African rand, after the price of the US Cent per 500 Zimbabwe billion dollars in 2008, according to the newspaper "The Guardian" published. In the midst of the economic crisis that has made ​​worthless Zimbabwean dollar , the population of this country was compelled to carry bags full of cash for shopping and buy their basic needs, and the prices were multiplying like crazy, prompting the government to suspend work in local currency. The central bank governor John Mangodia in Zimbabwe, this week, that the owners of the local bank accounts dating back to before 2009, they can convert their money to the US currency, that is the dollar exchange rate against the 35 quadrillion Zimbabwe dollars. 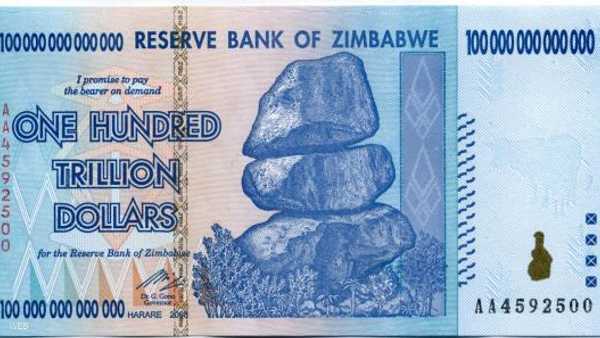 It is noteworthy that another currency is printed in Zimbabwe was $ 100 trillion, was not enough to take a bus to a small space in the capital, Harare, note that local currencies are sold as a souvenir for tourists.